In terms of presentation and public speaking basics, I don't think that this is a particularly spectacular solo presentation by Mr. Jobs. Sure, the environment is a lot more intimate than we typically see him in action, but consider the number of "Uhms" and backtracks... his core presentation seemed quite disjointed to me. Clearly, not as much preparation went into this small meeting as would a MacWorld Expo or product release. But, of course, why would there be? I'm just saying it shows in even the best presenters. That being said, about 3/4 of the way into the clip, the conversation starts... a dialogue between the council members and Mr. Jobs, and that's when his conversational skills really show and his universal appeal shines. Of course the topic of his presentation helps. 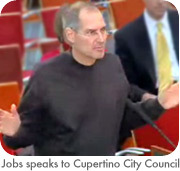 If he were telling the council members that Apple did not want to pay Cupertino taxes anymore, the dialogue would have been different. I think the key to his public presentations at larger events is that in his time to prepare, he is able to construct a dialogue... because if you watch his presentations, he phrases statements as if he is allowing time for a response. That is what is missing in the presentation, until the end when actual diaologue occurs. This was a brilliant PR move, and the whole down-home-ah-geez presentation style is what makes it work. Note how many times he reinforces his messages: a) we could have gone elsewhere, b) we paid a lot more than we wanted to, and c) we've been committed to Cupertino for 30 years and worked hard to stay. The surprised Council then starts asking how they can help!?!?! Watch for tax breaks and variance concessions to begin raining down upon Apple. Is that some Comic font in the iPod presentation? /me rubs his eyes.